Chromosomal architectural proteins are constantly exposed to mechanical stress. 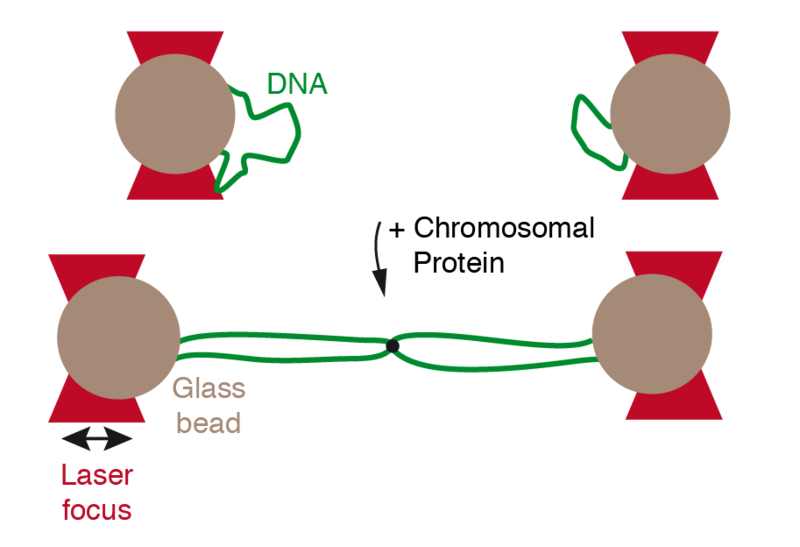 The SMC complex cohesin mechanically links DNA through topological entrapment and has to balance the pulling forces of the mitotic spindle until anaphase. However, the mechanical strength of interactions that define the stability of cohesin and other mechanical tethers are largely unknown. Figure: Optical tweezers assay for testing cohesion mediated by single SMC complexes. Our lab aims to explore the mechanical properties of chromosomal crosslinking proteins in single molecule force spectroscopic experiments. For example, SMC coiled-coil arms are flexible and it is thought that this plays an important role for the regulation of cohesin association with chromosomes. Mechanical pulling experiments allow testing the flexibility and structure of coiled coil structures with high precision. To understand the mechanical integrity of chromosomes, which is constantly challenged by external (e.g. mechanical deformation) or internal (e.g. collisions with DNA-bound motor proteins) stress, we also set out to directly investigate the mechanical properties of single protein-mediated DNA crosslinks.